The U.S. Environmental Protection Agency has launched a study of the potential economic impact forthcoming regulations that require shipping vessels to burn cleaner fuel might have on other transportation sectors, including trucking. Beginning Jan. 1, 2020, the vessels coming into those ports will likely shift from the fuel they now burn to ultra-low sulfur fuels like diesel currently used in trucks. That date was set by the International Maritime Organization, which has decreed that cargo and cruise ships in certain stretches of open water must either switch away from so-called “No. 6” fuel oil — commonly called bunker fuel — or use “scrubbers” that clean up the fuel. Scrubbers are pollution control systems that use a wet slurry of limestone and other chemicals to reduce the amount of sulfur in fuel. The international maritime industry uses an estimated 4 million barrels of fuel a day, the vast majority of it bunker fuel, said Tom Kloza, Global head of Energy Analysis with the Oil Price Information Service, citing U.S. Department of Energy figures. 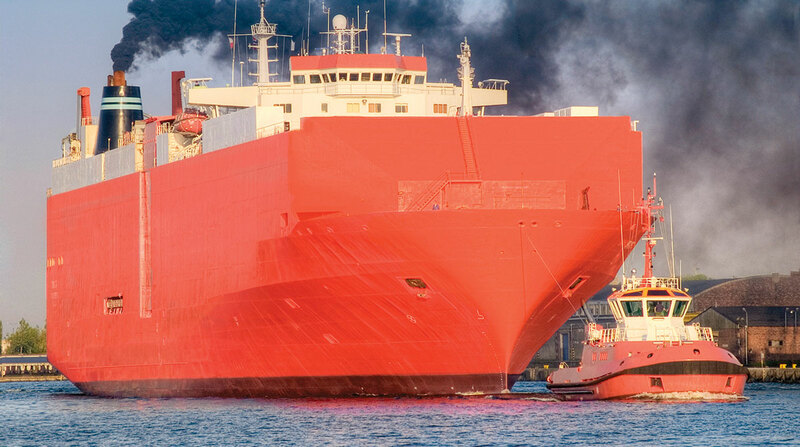 The new IMO directive applies to shipping vessels operating within 200 nautical miles in what is called the North American Emission Control Area. Along the Atlantic and Pacific Ocean coastlines the ECA is thousands of miles in length, and encompasses areas off the United States — including Hawaii — as well as Canada and the French majorities of Saint Pierre and Miquelon. At 200 miles out those ships are in international waters and subject to IMO rules. The United States, Canada and France have agreed to follow the regulations since these ships often dock in their ports. This latest move follows earlier IMO efforts to clean up cargo ships’ emissions; in 2015, it directed all oceangoing ships operating in the ECA to begin using fuel that contained 1,000 parts per-million or less of sulfur content. Scrubbers were sufficient to bring bunker fuel into compliance, but for this next round of enforcement, scrubbers become cost-prohibitive, said Kloza. EPA said that earlier move helped reduce air pollution from particulate matter and sulfur emissions by more than 85%, and said adoption of the 2020 standards would do more. However, in 2016, the Senate Appropriations Committee directed EPA to study the possibility of loosening the air quality limits for ships entering the United States over concerns the IMO’s tougher regulations could harm the cargo shipping industry’s economic competitiveness. The agency’s just-launched study is the response to that directive. Specifically, the committee wants EPA to consider an exemption from the ECA restrictions for vessels that have engines that generate less than 32,000 horsepower and operate more than 50 miles from the U.S. coastline. The world’s largest containerships have engines capable of more than 100,000 horsepower. For the study, the EPA will for the next several months seek input from transportation stakeholders to learn more about how the looming shift might impact their industries. For trucking, the key issue is how the change will affect the marketplace for diesel fuel, said Glen Kedzie, Energy and Environmental Counsel for American Trucking Associations. “The big factor here is the cost of fuel — that’s the biggest input you’re going to be looking at here,” he told Transport Topics. OPIS predicted last month that diesel could be as much as a dollar a gallon more expensive by the end of 2019 or early 2020. However, EPA’s Revelt cautioned against getting overly concerned today about how the change might affect diesel prices tomorrow. EPA expects to complete its report by September 2020.